Ulrike Peter, Senior Policy Officer (International) here at Universities Scotland discusses a brand new publication, Guidance for Universities on Providing Asylum Seekers and Refugees with Access to Higher Education. The guidance is a collaborative effort between the Scottish Refugee Council and heads of admissions from a range of Scottish universities. Forms. They are a universal element of applying to a university in the UK. For UK-domiciled students, much of the process of applying to university is taken care of by UCAS. But there’s still the form to fill in with all your personal details and specifics about your academic career to date. But what happens when you’ve fled persecution and violence and don’t have the documentation to prove your academic credentials to allow you to continue your studies in new surroundings? Today in Scotland there are approximately 50 students in Scotland with refugee status and between 200-300 students with settled status. Settled status means being both ordinarily resident in the UK and without any immigration restriction on the length of your stay in the UK. 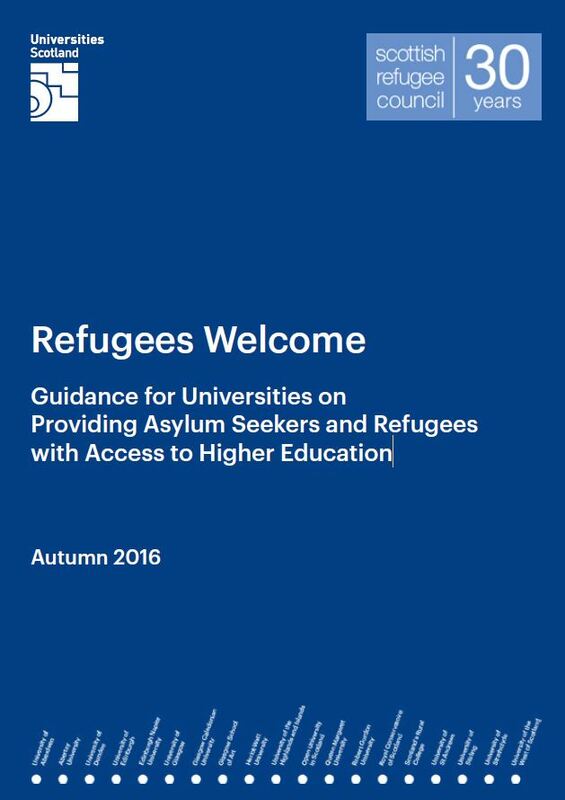 For these current and future students and their universities, we have published Refugees Welcome. 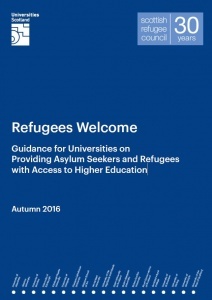 Refugees Welcome provides guidance for Universities on Providing Asylum Seekers and Refugees with Access to Higher Education. Working with the Scottish Refugee Council and head of admissions from a range of Scottish HEIs, we identified the issues faced by refugees who don’t have documentation but wish to pursue opportunities in Higher Education. The guidance was also created to help admission staff develop their processes to admit and integrate refugees into their chosen university. We started earlier in 2016 and have been refining our initial guidance in the last few months after an active response from within the sector to develop this guidance. The guidance will be sent to all admissions staff at universities in Scotland. The intention is for the guidance to be a live document and to that end, we will be happy to receive feedback at any point. Universities have access to large student and staff bodies willing to dedicate their time, skills and resources to helping people fleeing conflict who are trying to make better lives for themselves. This guidance seeks to embed good practice across all of Scotland’s 19 universities. The message is clear: at our universities, Refugees are Welcome. Read the guidance on the Universities Scotland website.